Italy's Stealth is another case where first impressions can be deceiving. Established in 2007, but only really picking up speed in 2012, the band delivers their first album Shores of Hope, a totally DIY project. Stealth: out in the open. It was the very first song that threw me off, not the entire album, upon the first spin. Guns! Guns! Guns! reminded me of a punk rock song for some reason, maybe the groove and beat. Yet the rest of the album blurs the lines between traditional melodic hard rock and heavy metal. It's rather straightforward stuff: often heavier riffs, sharp guitar leads, and strong melodies powered by a solid hard rock groove. Sometimes the rock groove is the major propellent as with The Border. Alternatively, almost Sabbath like heaviness trades turns with the groove and speed as within Ozone Fades. Then Stealth can deliver a metal anthem with Uhlans 1915, a somber disturbing song about WWI. Also, if you like strong guitar riffs and burning leads, Shores of Hope is filled with them. Though they have two guitarists, there's no indication if those are shared lead guitar duties or not. But the solos are quite nice, nonetheless. For a self-produced album, the clarity from recording to mixing and mastering is also quite surprising. Somebody in the band has some experience around a studio. Stealth's Shores of Hope may not set the world on fire as being new or novel, but the band is quite talented creating some solid and entertaining melodic hard and heavy rock. 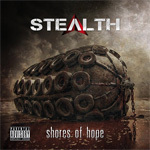 Stealth's Shores of Hope may not set the world on fire as being new or novel, but the band is quite talented creating some solid and entertaining melodic hard and heavy rock.